Editor’s Note: Since yesterday was an American holiday (Labor Day), Mark Rosewater decided to take the day off. Fine, it wasn’t him, Wizard’s website doesn’t really update on holidays, so he didn’t have to write a new article. Lucky him. So, I don’t have anything to write after him. I could be like him and take the day off, but he has tons more readers, and I need to get back on track. (Yes, he came out and talked about the rules of Planeswalkers, but we won’t touch on them until we see the set to find out the interactions they’ll have on the game). 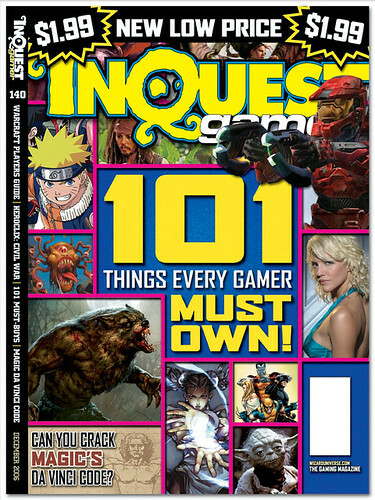 It was announced that magazine InQuest Gamer is being discontinued after 150 issues. This leave a little whole in my gaming heart. While I haven’t picked up the magazine in over 2 years, it still saddens me that we’re losing a long time staple in gaming. While this doesn’t seem like design news at all, it really isn’t completely, though it will tie in later. This lost has been contributed to the rise of the internet, where gamers can get announcements and ideas for their games quickly, rather then once a month, with two months ago strategy. As you can see by their 140 issue, they lowered their price down to $1.99 American, or $1.99 Canadian (Thanks to the amazing exchange rate we have going right now), to try and get more readers. That clearly did not happen. I used to read it in the beginning when it was called InQuest. They added the “Gamer” to make it be known what they were doing. The did alot of Magic coverage, leaking new set information, ranking the cards on a 1-5 Star rating (not always being right, like always), and creating fake Magic cards that people thought were real (like that infamous 6th color). After a while, they spread out their coverage to include more CCGs, and computer/console games. Finally, when that juggernaut Yu-Gi-Oh! hit, they had alternate covers with whoever that guy is on them and, in my opinion, it went down will from there as it spread it’s coverage too thin and not enough of my money should go to something that focuses too little on Magic. But before that happened I would get an InQuest magazine for the summer, and create decks, and re-read the articles over and over again and design my own cards (surprise, right?). Since I was usually in an area that no one else played Magic, this would be my escape, and I was happy. They had some humorous articles in there from how to play Kangaroo Court Magic to MagicClix, a Clix version of Magic. One bit they did really stayed with me enough that when I heard that InQuest was being shut down, I almost wrote about it today. I tore it out of the magazine a few years ago and I have it sitting on my desk, somewhere lost in the pile of clutter. After I finish the Color Pie Identity Project, I’ll tell you what I have, and what it has to do with that article. Very few gaming magazines are existing in this internet age. I think one of the main reasons Scrye lives on is because of the price guide that most people use while trading. Not everyone has wireless internet that can quickly to find out prices online. Rest in peace old friend. You shall be missed.